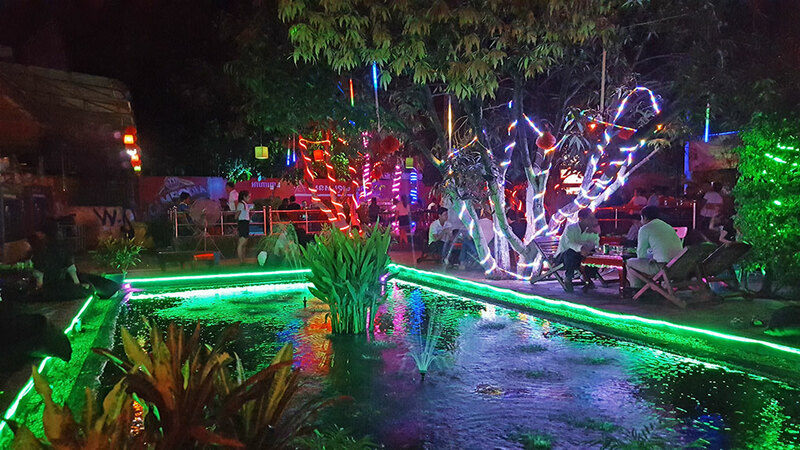 Bright lights at a typical Siem Reap beergarden. 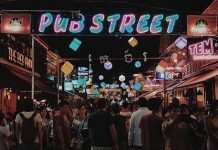 A night out on the typical tourist Pub Street offers an intriguing variety of backpackers, tourists, and expats around the world, and is certainly a must-do on your checklist to Cambodia. It is a fun way to connect with fellow like-minded travelers and expand your ideas from the global-perspective. However, it is easy to get caught up in the bubble of tourism, a carefully curated scene made especially for visitors. If you were to ask a local what a night out on the town means, it surely would not be what you find out on the streets of the backpacker city center, eating tarantulas and drinking cocktails out of chamber pot buckets. 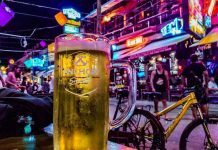 Only a few kilometers away from the tourist epicenter of Siem Reap lies the true night life of Cambodian people – which is known to most as Khmer Pub Street. This lively area, open from 6pm – 2am, is located just off of National Highway 6 and is where you’ll find young Cambodians enjoying a night out with their friends in traditional Cambodian fashion – catchy Asian tunes blaring unnecessarily loud from overhead speakers, drinking Angkor canned beer out of cups with ice, and of course, deliciously seasoned, spicy peanuts eaten with chopsticks. The concept of a beer garden, which originates from Germany in the 19th century, takes on a bit of a new meaning in Cambodia. The beer gardens which locals enjoy on the weekends in Siem Reap are usually spacious, outdoor areas, where you can drink a local beer, get your fill of true Khmer drinking food (such as seafood fried rice, various meat dishes, curry, and noodles), and sometimes even sing karaoke off of a small screen with your friends. The scene is carefully curated with glitzy lights and a warm ambiance to create an exciting night out after escaping week’s daily work – including singing, dancing, and pretty hostesses to greet you at the front. Some beer gardens are attached to KTVs (karaoke joints) or offer private rooms for larger parties of friends to drink and blast music as loud as they please. As a foreigner, visiting a beer garden can be a very interesting cultural experience, and Cambodian people will surely welcome you with friendliness and a good conversation – but don’t expect to order food and drink off the menu with ease, as it’s all in Khmer! A fairly new operation which is becoming a popular nightlife destination for locals is the Siem Reap Container Bars. This plaza is located off of Charles De Gaulle, right next to the Tara Angkor Hotel. It is quite the trendy design – made up entirely of cargo containers stacked upon each other, creating many little unique pubs. Upon walking into the plaza, you’ll be presented with a maze of roads leading to over 20 different container bars: some are more romantic and ideal for a couple’s date, and others are geared towards large groups, watching sports, grubbing down on some spicy noodles, or dancing your heart out to Cambodian jams. There is a container bar to suit the needs of every visitor. Towards the front of the plaza is a huge stage, where performers sing every weekend and after a proper amount of drinks, locals dance along in the crowd. This unique and chic plaza of container bars is a must-see during your trip to Siem Reap in order to get the true cultural experience.